Shattering a record for annual Chinese launch activity, a Long March rocket streaked into a predawn sky Thursday and entered orbit with a Beidou navigation satellite. A Long March 3A booster lifted off at 2107 GMT (4:07 p.m. EST) from the Xichang space center in southwest China's Sichuan province, according to the state-run Xinhua news agency. The launch occurred at 5:07 a.m. Beijing time. The 172-foot-tall Long March rocket deployed China's 10th operational Beidou navigation satellite launched since 2007. Chinese officials said the launch was successful. The spacecraft is bound for an inclined geosynchronous orbit more 22,000 miles high with an inclination of about 55 degrees, putting the satellite in range of navigation users at high latitudes. Xinhua reported the basic structure of the Beidou system has now been established, and Chinese officials are conducting tests and evaluation of the navigation network. Positioning, navigation and timing services could be available across China and neighboring regions by the end of this year, according to official news reports. China will launch more Beidou satellites next year, and the system will be complete by 2020 with 30 satellites in orbit. The satellite constellation, also known as Compass, is designed to end China's dependence on the U.S. military Global Positioning System. 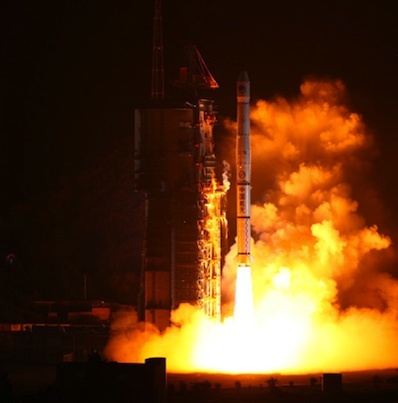 It was the 16th successful space launch this year for China, eclipsing a record set last year. One or two more Chinese launchings could occur before the end of 2011, further extending the record mark. A Nigerian communications satellite and an Earth imaging satellite are next up on China's launch manifest. Both missions could be launched this month. One Chinese space launch failed this year, when a glitch in a Long March rocket's control system doomed an experimental military satellite in August. Successful missions for China this year include the launch of the country's first prototype space station module in September, followed in October by the liftoff of a Shenzhou capsule outfitted with a docking adapter. The two unmanned vehicles achieved two autonomous dockings in orbit, setting the stage for astronauts to blast off next year for a manual link-up. China also orbited spy satellites, communications platforms and research craft in its 16 launches so far this year. Russian rockets have reached Earth orbit 26 times this year, but three missions did not reach their planned trajectory, including the Phobos-Grunt probe that was supposed to voyage to Mars. A Russian Soyuz rocket crashed back to Earth during an Aug. 24 launch attempt with supplies for the International Space Station. The United States is 17-for-18 in space launch attempts in 2011, with no more missions planned until January.